As we move into the New Year, many around the world are at the edge of their seats, awaiting one of the most highly anticipated elections of the year: the Mexican presidential election on July 1. With Enrique Peña Nieto leaving office after the end of his highly contested 6-year term, this year’s elections will play a large role in determining the future of the Mexican economy and party politics. Peña Nieto’s presidential victory in 2012 marked the end of a 12-year hiatus in the otherwise uninterrupted political rule by the Partido Revolucionario Institucional, or PRI. The center-right PRI had dominated Mexican politics since its founding in 1929, and was consistently plagued by corruption, fraud, and questionable arrangements with drug cartels during this time. This single-party rule continued for 71 years until the seat for the presidency was lost to the Partido Accion Nacional (PAN) in 2000, and again in 2006. 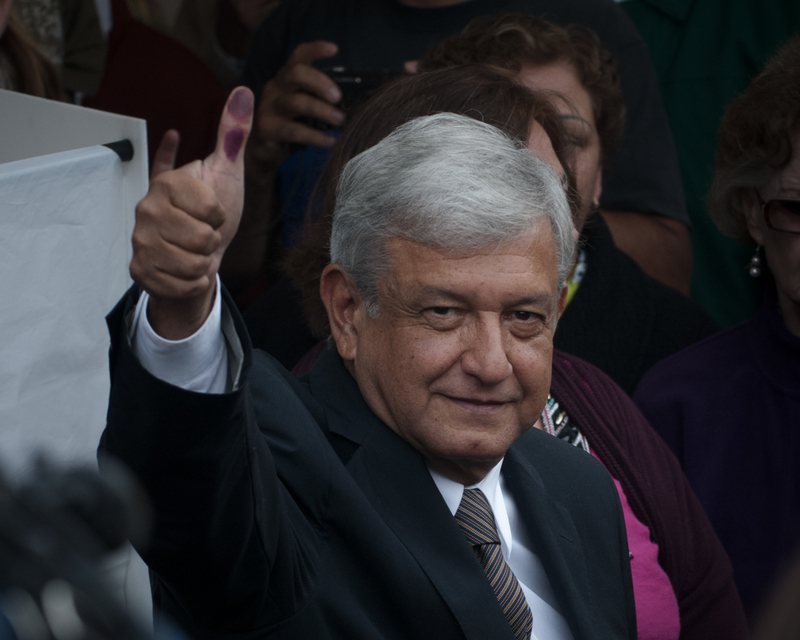 Following a disappointment with the lack of growth during PAN’s 12 year-long rule, many voters turned back to the PRI in the 2012 election, electing Peña Nieto to office with roughly 38% of the vote (The Washington Post). During his campaign, Peña Nieto promised constituents a break from the dictatorial nature of the PRI in the past. However despite this platform, many believe that the sitting president has only revived the worst of the PRI with an administration plagued by scandal, gang activity, and soaring rates of violent crime. As a result, according to a Pew survey in September, only 28% of Mexicans hold a favorable view of the sitting president, making him Mexico’s most unpopular president since pollsters began such surveys in Mexico the 1990s (PEW). Now, as Peña Nieto leaves office, the country is left in a toss-up between re-electing a member of the scandal-haunted PRI party, or one of the astonishing 85 potential independent candidates pursuing the presidency. The renegotiations of NAFTA with the U.S. and Canada this spring will likely play a major role in determining the outcome of the election. Alas, although all of the major parties have yet to formally declare their candidates, this critical time gives us a chance to observe the different actors that will become major players come July 1. With Peña Nieto stepping down in 2018, the party must choose a new candidate to lead it into the coming years. Though the PRI has yet to formally declare its candidate, the most likely is Jose Antonio Meade, Mexico’s former finance secretary under Peña Nieto. In November, Meade announced his plan to run for the PRI nomination. Many are weary of Meade and the manner in which he declared his intention to run. In November, Meade resigned from his position as finance secretary with heavy support and praise from the sitting president, but with no mention of why he had chosen to step down. This mysterious resignation, for many, resembled an old PRI ritual known as ‘El Destape’, in which the president would choose and present his preferred successor, who would then be praised by members of the PRI and the media. Many were critical of Meade’s resignation and the praise from Peña Nieto that mirrored the practice of ‘El Destape’, given the country’s apparent desire to move away from some of the archaic—and even obsolete—systems instituted for 71 years under the PRI (The Washington Post). The media has painted Meade as a ‘clean’ candidate, with a good track record absent of scandal or corruption. However, due to the party’s reputation and the sitting president’s low approval ratings, it appears unlikely for any candidate who identifies with the PRI to see huge success appealing to voters in the coming election. Meade’s popularity with large businesses and investors also generates some apprehension, given the PRI’s especially low support from the working classes. Due to the PRI’s current unpopular image, it is likely that in the event that Meade is formally chosen as the PRI’s candidate, he will try to distance himself as far as possible from the party establishment. The party will likely portray Meade as a safe candidate who can work to repair the party’s toxic past and move towards a scandal-free future. One of the largest criticisms of the PRI in recent years has been Peña Nieto’s weak response to President Trump’s antagonistic claims and policy plans. However, former mayor of Mexico City Andrés Manuel López Obrador (better known as AMLO) has formed a powerful campaign to counter Trump’s threats and domineering strategy. AMLO, formerly a member of the leftist PRD, formed an offshoot party called MORENA (Movimiento Nacional de Regeneración) in 2012. Though he ran and lost in both the 2006 and 2012 elections, the rise of Trump in the United States has created a level of voter discontent strong enough for Obrador to capitalize on and use as fuel for a new campaign. AMLO has become incredibly popular in recent months through a populist and nationalist movement that criticizes the PRI’s foreign policy and promotes a more aggressive stance to counter that of the U.S. President. Ironically, many have described AMLO’s strategy as ‘Trumpian’ in nature, given his push to consider Mexico first, an anti-establishment flare, and his own ability to inspire and move masses of people to support the cause. However, despite his Trump-like qualities as a leader, his political approach could not be more different: he has harshly criticized Donald Trump’s rhetoric and policies, and he has fiercely resisted the United States’ plans to build a border wall and renegotiate NAFTA. He holds many leftist values, including tax increases and strong social welfare systems. AMLO has even been compared by many to the late socialist Venezuelan dictator Hugo Chávez given his leftist rhetoric and his ability to mobilize the lower classes. However, it is this same assertive and nationalist nature that invokes concern in many who fear tension between Mexico and the United States. Especially in the U.S., some are worried that the election of AMLO to the presidency could be ‘disastrous for Trump and his administration’ (Politico), since his more aggressive stance against Trump’s rhetoric and policies could lead to an increasingly strained relationship between the neighbors. Particularly with the upcoming talks and renegotiations of NAFTA, many say that the success of AMLO is dependent on Trump’s own actions. For example, if Trump is to follow through on his threat to pull out of the trade agreement, this could create a host of voter frustration that AMLO could continue to capitalize on and take advantage of to secure his election (Politico). AMLO’s populist strategy appears to be working—he currently leads in the polls with 33% of voter support (El Financiero). Given the large number of third-party candidates in 2018, the next elected president could win with just a plurality (rather than a majority) of votes—meaning that a level of voter support this high could be just enough to elect the former Mexico City mayor to the presidency come July. Another leading candidate in the 2018 election is Margarita Zavala, wife of former President Felipe Calderón of the Partido Acción Nacional, or PAN. At first, Zavala labeled herself the ‘Mexican Hillary’—however, following Hillary Clinton’s loss in 2016, this strategy faltered, costing her support within the PAN. As a result, in October 2017, Zavala distanced herself from the party and instead decided to run as an independent candidate, alongside 84 other potential candidates who have done the same. When the former first lady chose to leave PAN, she did so claiming that the party had succumbed to the corrupt interests of the leadership, which had forged a cross-party alliance with the PRD. This claim and her exit was met with firm criticism from party leader Ricardo Anaya, who argued that her departure from the party would only serve to help the PRI in the election (Quien Politica). Zavala has run on a campaign for a ‘movement of free Mexicans’ (The Washington Post). Although she has yet to frame a specific political agenda, she has proven popular with the Mexican people, following closely behind AMLO in the polls with 27% of voter support (El Financiero). While Margarita Zavala departed from her husband’s party, Ricardo Anaya Cortés stepped down from his role as President of PAN and announced his intention to run for the presidency through a cross-party alliance with the Partido de la Revolución Democrática (PRD) and the Movimiento Ciudadano (MC) in a coalition called ‘Por Mexico al Frente’ (‘For Mexico to the Front’). The 38-year-old lawyer and politician has been associated with the PAN since 2000, when he was elected the Local Deputy in the 14th district of Querétaro at age 20. Anaya is highly qualified and has proven to be quite popular within the right-wing party. He trails 4 points behind Margarita Zavala, with an estimated 23% of voter support. Although he too has yet to outline a clear policy plan, he too has indicated a strong opposition to Trump’s plans to build a wall on the U.S.-Mexico border. In the coming months, it will be imperative to watch how Ricardo Anaya and the Por Mexico al Frente coalition progresses; after all, PAN was the party that took over power from the PRI in 2000, leading the country into 12 years of relatively unpopular right-wing reforms and an unsuccessful move away from corruption and drug violence. Now, however, nearing the end of Peña Nieto’s controversial 6-year term, the overall approval of PAN has boosted, with 38% having a favorable view of the party (up from 29% in 2015) (PEW). So, it is up to voters to determine whether this cross-party coalition with PAN and PRD will be enough to overcome the incumbent PRI in the coming election—or if all major parties will lose to an entirely new political force. Joshua Partlow . (2017 Feb 16). "A Mexican populist rises to face Trump’s America". The Washington Post . Quien . (2017 Oct 6). "Margarita Zavala renuncia al PAN para competir como independiente en 2018". Quien Politica . Alejandro Moreno . (2018 Jan 2 ). "AMLO toma ventaja rumbo a 2018". El Financiero . Sabrina Rodriguez . (2018 Jan 7). "Mexico's Trumpian populist could mean trouble for Donald Trump ". Politico . David Argen . (29017 Nov 17). "Mexico is a democracy, but the ghosts of one-party rule live on". The Washington Post . Margaret Vice , Hanyu Chwe. (2017 Sept 14). "Poor ratings for Peña Nieto, political parties". Pew Research Center . Nick Miroff , William Booth . (2012 July 2). "Peña Nieto is winner of Mexican election". The Washington Post .